The Terratek variable speed rotary tool kit with 234pc accessory set is a versatile tool that allows you to grind, cut, sand and drill. Rated Power: 135W. 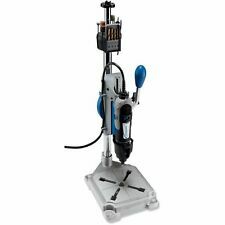 26150220JB Combined Drill Press and Tool Holder. 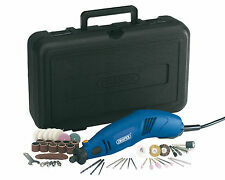 40pc Accessories * 2 Warranty * Accepts DREMEL access. 135W, 10000-32000RPM. Spindle lock for accessory changing. Includes a range of accessories sanding drums, diamond wheels, brushes, sanding discs, wire brushes, twist drills. Draper Rotary Multi-Tool 230V 140W with Carry Case & 56 Accessories. Suitable for drilling, milling, grinding, polishing, engraving, cutting and many other tasks. 1 x bristle wheel. 1 x bristle brush. Lumberjack DRT170 170W Rotary Tool. 1m Flexi Shaft. 120 Piece accessory kit. Padded canvas carry case. This highly versatile Rotary Drill Multi Tool Kit would be a great addition to any DIY fanatic or hobbists toolbox. 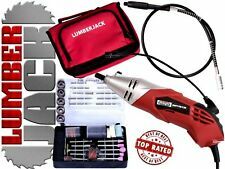 It works on a high speed, low torque principle where the revolution can attain 32,000rpm compared to a typical 2,800rpm for a standard electric drill. This highly versatile Rotary Drill Multi Tool Kit would be a great addition to any DIY fanatic or hobbists toolbox. It works on a high speed, low torque principle where the revolution can attain 30,000rpm compared to a typical 2,800rpm for a standard electric drill. This little drill has a variable speed adjuster, and it still works fine. This 3 Jaw Keyless Drill Chuck allows you to quickly and easily change accessories on GOXAWEE Rotary tools without using collets & Accepts accessories from 1/64” to 1/8” shank. ♥GOXAWEE TOOL is the source for hard-to-find mini tools for crafts and hobbies.We selected all these bits, cutters, wheels more durable and last longer than other common materials. Ending Soon. drill bits. 8x cutting wheels regular cut off wheel. Usefull Link. fabric wheel. felt wheel. Add to Favourites. 1x felxi shaft. GUILD 130W Rotary 218 Piece Tool Kit. The Guild 218 Piece Mini Tool Kit is an essential addition to any tool kit. Perfect for cutting, sanding, grinding and polishing. Includes 218 accessories perfect for cutting, sanding, grinding and polishing. ♥GOXAWEE TOOL is the source for hard-to-find mini tools for crafts and hobbies.We selected all these bits, cutters, wheels more durable and last longer than other common materials. 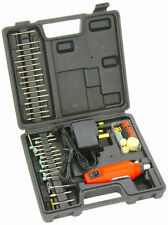 ♥GOXAWEE TOOL will help any one who requires precision small tools and micro tools. 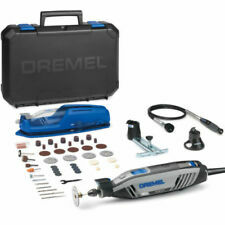 Dremel Professional 7360. Great quality dremel, complete with foot control and flexible shaft. Motor is all good. Ufortunately the shaft has broke so will need to be replaced. So sold as is. Spare or repair. Runs smoothly with no front bearing noise. Brushes in good condition. Both sizes of collet present as is the collet spanner. 110V - US Plug. Rated Input Power : 180W. Versatile tool that will cut, grind, sand, drill, sharpen, polish and so much more. 4 x Sanding bands / 12.7 x 12.7mm. 4 x Sanding band / 6.3 x 12.7mm. 2 x Sanding shank / 12.7 x 12.7mm | 6.3 x 12.7mm. Combined Drill Press and Tool Holder. Garden tools & Furniture. Test Connectors. Test & Detection. Work & Protective Clothing. Building Supplies. Music & Drama. Maths, Humanities & PE. The Guild 218 Piece Mini Tool Kit is an essential addition to any tool kit. Perfect for cutting, sanding, grinding and polishing. GUILD 500 Watt Multi-Function Shark Saw. Includes 218 accessories perfect for cutting, sanding, grinding and polishing. Dremel drill.press and flexi . Fixings bagged. Dremel drill.press and flexi . Fixings bagged.. Condition is Used. Dispatched with Royal Mail 2nd Class. 5 out of 5 stars - Dremel drill.press and flexi . Fixings bagged. 72 product ratings72 product ratings - Dremel drill.press and flexi . Fixings bagged. It's also perfect for ceramics, crafts, and jewellery making. Perfect for Beginners and Experts Alike. Soft grip for comfortable handling. Variable stroke depth for various engraving effect. Unlimited Personalisation and Decorative Options. For sale is my Rotacraft Rotary Tool Kit. As new, barely used. 44 different attachments/accessories. No reserve, grab a bargain. Thanks for looking. Flexi Shaft. 1 x Screw Mandrel. 1 x Mandrel. It works on a high speed, low torque principle where the revolution can attain 30,000rpm compared to a typical 2,800rpm for a standard electric drill. Drill Specifications. 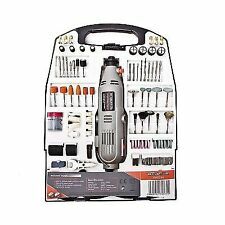 Dremel F0132050JB Stylo 240V Rotary Tool - Grey. Dispatched with Royal Mail 2nd Class. Dremel 4000 Rotary Tool, which I don't recall ever using it so is practically new. No accessories are included with this except the ones you can see pictured. Included is a very handy hard case and wall mount for the Dremel. There is also the attachable handle for delicate work. These items were only available when buying the 4000 kit with accessories. Reason for sale, I'm changing all my tools to a different brand and I've already replaced the Dremel. Collection in person from Reading. It accepts accessories from 0,5mm to 3,2mm shank. It accepts all accessory bits with 1/32 and 1/8 shanks. 1 x Keyless Chuck. Versatile tool tackles all kinds of craft, DIY, grinding, drilling and engraving jobs. Perfect For Diy Use. Lightweight and easy to use. Kit includes a range of accessories and AC-DC adaptor. Quick connect system easily attaches to your rotary tool in place of the housing cap without the need of tools. Baby Accessory. Compact design allows you to get into hand-to-reach places. Ball bearing and spiral bevel gears give long lasting durability along with smooth and cool operation. 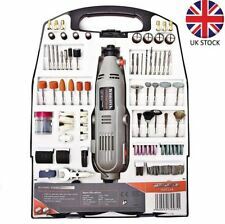 162pc Kit Includes 10 x Grinder Wheels with Shank. 12 x Grinder Wheels. 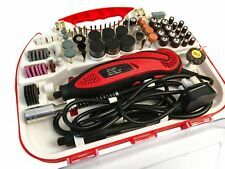 162 PC Mini Drill & Bit Set with Storage case. 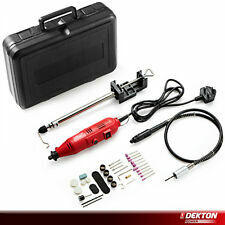 Ideal tool for hobbyist and small DIY tasks. 8 x Polishing Wheels. 6 x Drill Bits. This is ideal for sanding, grinding and polishing. This makes it possible to easily sand rounded shapes preventing slippage by keeping tools at 90 degrees and you can work for longer as there is no weight from holding the tool. Furthermore this tool is perfect for finishing off detailed work, sanding, polishing, cleaning and more. Cordless Power Tools. Power Tool Accessories. Tool Storage & Security. Compact storage case. Head Office. Electric 240v Combitool Rotary Multitool Combi Multi Tool Hobby. MOSS Combitool, Flexishaft and Stand. MOSS Combitool Power motor unit x 1. Combitool Stand x 1. Moss Pro 120W Electric Orbital Motion Car Van Polisher Polishing Buffer Kit. Ryobi ERK-1502V Rotary Tool Kit . Hobby toolset used for model trains. Condition is Used. Includes stand and flexible hose. Weight including case almost 5kg. Multi Function Tools. Power Tool Kits. Unique tool holder included for easy storage of your tool with your project ✓. Tool Boxes / Bags / Organisers. Spacious and sturdy storage case with a removable accessory tray ✓. The collet lock out function prevents you from accidentally blocking the output shaft of the tool. This tool is an absolute must for the most demanding craftsman. Unique tool holder included for easy storage of your tool with your project. Has been used but still in good condition has been tested for safety. Comprises of Drill Chuck Key and a small amount of Drill Pieces. This 135w DIY 135w Multi-Function Rotary Tool 249765 is an ideal addition to anyone's tools. DIY 135W Multi-Function Rotary Tool. See Silverline website for full details. No load speed 8000-32,500rpm. 10Pcs 22mm Rotary Tool Accessory Diamond Cut Off Wheel Disc Fits Rotary Tools. 1set=Cutting Discs X 10 Mandrel X 2. Can be used with your rotary tool to cut a wide variety of materials. Compatible with the majority of rotary and air tools. This lot is very handy for people who enjoy wood craft for making pattern on your work rebates skirting Table making etc etc. There is also spare cutters included. Excellent condition though has been used by Tradesperson. DREMEL Trio 6800 Multi rotary tool drill router w case 20,000 rpm 3/16"